Buyandship is 4 years old! 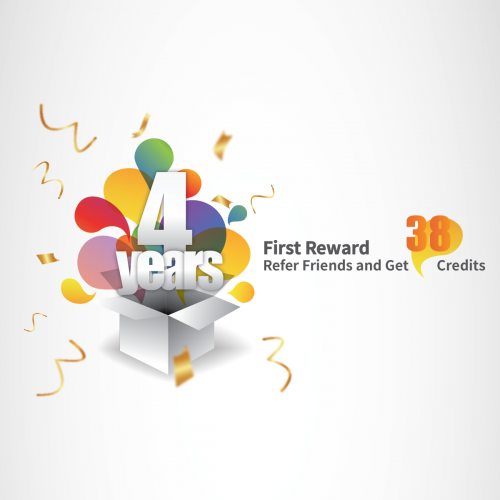 And we want to celebrate our fourth anniversary with four rewards! First of all, we would like to thank all members for their generous support. Our promise to everyone: We will always strive to become even better in the future, and to provide the best service possible! Happy 4th Anniversary, with our 4 rewards celebrations! Enjoy our first reward: 38 credits for you and your referred friend! Black Friday is around the corner, and wouldn’t it be great to get some Buyandship credits until then? It’s really simple: invite your friends to register through your ‘Referral Link’ or through your ‘Friend Referral Number’ and become a Buyandship member during the promotion period. After completing the first transaction, both parties will get 38 credit points, 1 point is equivalent to 1 HK$. The credits can then be used to offset shipping costs on your next Buyandship order. There is no limit to the number of referrals. The more friends you refer, the more credit you can earn! Start collecting credits now through friend referrals and you and your friends will be able to use them just in time for Black Friday! Happy Shopping!
. The Friend Referral offer starts on November 1st, 2018 and ends on November 30th, 11:59PM.
. Your referred friend must complete a first US, UK, Japan, Korea or Taiwan transshipment transaction on or before November 30, 2018 (based on the completion of the pickup time).
. The credit points will be automatically added into the accounts of both parties within 21 days after the referee completes the first transaction.
. To use the “Friend Referral Number”, the referral number must be entered at the time of registration, otherwise no reward points can be earned.
. When you use the “Referral Link” to register, your referral code will appear in the referral code column. If you do not have to re-enter the 10-digit “Recommended Friends Number”, you will not be able to earn points rewards.
. “Refer your friend” reward points are only available for registrations within the same country or city.
. China’s transhipment orders will not be counted.
. The points awarded through this event will be valid for 90 days.
. By participating in this offer, the customer states that he understands and is willing to abide by the terms and conditions of the event.
. In case of any dispute, the company will reserve the final decision.